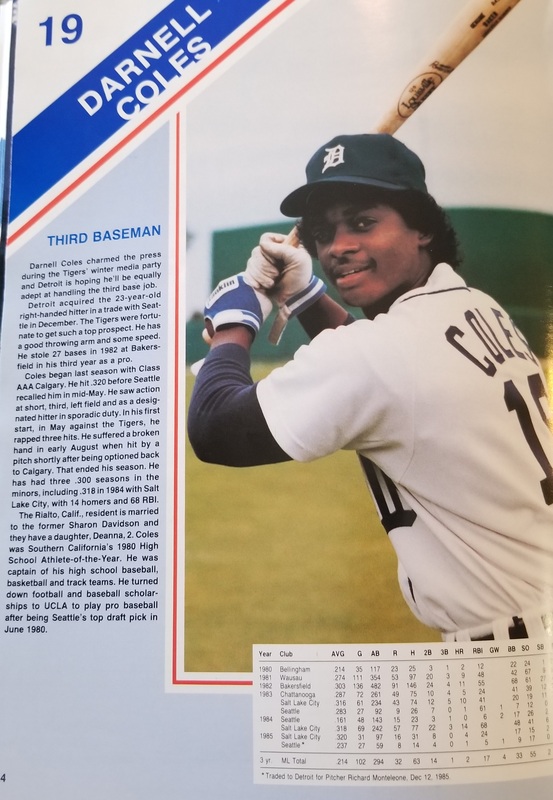 Darnell Coles had that one nice year in his career, at least with the bat, in 1986 immediately after the Tigers acquired him in exchange for SFA. He was part of that infield where all 4 hit at least 20 HRs. Less that 2 years later the Tigers traded him, in exchange for SFA. He and Glenn Wilson were eventually traded for each other. Coles hung around for 14 years, but only reached 100 games played in 3 of those. Weird. He also came back for the second half of 1990 after being acquired from the Mariners for outfielder Tracy Jones. He also came back in 2014 as the assistant hitting coach. He's currently the hitting coach for the Milwaukee Brewers. I seem to remember he would let things really get to him easily . I remember once incident when he got frustrated with an at bat that ended the inning and during the warm ups between innings when they were tossing the ball between the infielders he took the ball and chucked it over the roof on the first base side (he did have a **** of an arm). I am pretty sure Sparky pulled him out of the game soon after that. Another solid effort today, boys. Doubleheader rescheduled for June 4, Draft Day. Mother nature putting up some serious run prevention stats here early - but she's bound to regress to the mean with windblown home runs and GB through hard baked infields later in the season. Yeah, Coles was a good 3bman for one year, 1986, the answers to our prayers, then just like that, he sucked again in 1987, had a nice second half in 1988, then disappeared. The Mud Hens were rained today, too. As such, they made there northeast a couple of blocks to take in the Toledo Walleye playoff game against the Indy Fuel. So, during the broadcast, the camera pans up to the suite of Mud Hens. (Un)Oddly enough, you make out in the background a silhouette of someone in a black leather Arthur Fonzerelli jacket doing a keg stand. It was made mention of the fact that Deuce and one of the Walleye players (Simon Denis) is from the same home town of Burnaby. Burnaby, as everyone knows, is Canadian for "Canadian Las Vegas". Somehow or another, Deuce and Denis are missing from the wikipedia roll call of famous Burnabites. That's some first-class research, right there. Of course Jim is a Canadian citizen (dual US/Canadian), everyone knows that, but making the connection to Seemone Denee (they probably don't pronounce it like that in BC), that's PhD level research. Jim is 6 years older than Simon, and unfortunately Jim left the Vancouver area for good when he was about 2 so he wasn't able to mentor Simon. I've been looking high and low for a rap sheet for Simon.